This recipe was originally from the cookbook “Baking” but was for Blueberry Cookies. 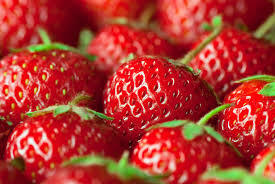 We have adapted it for strawberries and have found them to be so much better when baked into bars. This is one of my very favorite desserts that we serve on our dessert bar in the evenings. I’ve even been known to top then with a spoonful of soft vanilla custard ice cream and a few extra berries to make my own version of strawberry shortcake! Grease and flour an 8 x 8 inch baking dish. Lightly combine the butter until the mixture resembles fine bread crumbs. Stir in the sugar and the lemon zest and then add the sour cream and the strawberries. Stir until combined and pour mixture into baking pan. Bake at 375 and check doneness after 25 minutes. Glaze with a simple glaze of sifted powder sugar and half and half. This entry was posted in Desserts, Fruit, The William Henry Miller Inn by admin. Bookmark the permalink.